Starting in August 2016, Akun.biz provides a new feature, which are the Debts Book and Credits Books. These books is only currently available in the online version (https://www.akun.biz/apps), but soon will also available on Android and iOS versions. This new features can be accessed in the Debts & Credits menu group. 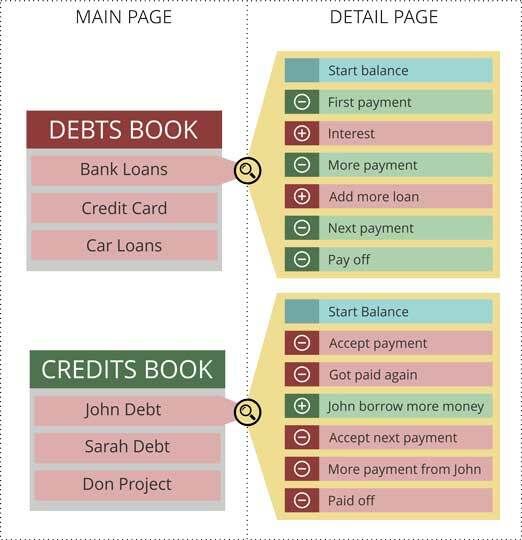 This is the basic tutorial of Debts and Credits feature in browser version. Click here if you want to see the tutorial of the Android and iOS version. Basically between Debts Book and Credits Book has similar way of recording. We split this feature into two pages, the main page that contains a list of Debt or Credits, and sub-pages that contain the details of certain debt or credit. If you are a Premium user utilizing multiuser features, then Debt & Credits can only be accessed by manager. On the main page, you can add new debts or credits. Click the “New Debt” or “New Credit” button. Enter the data in the pop-up window that appears, especially the Amount and Client (name of person / company in which you owe or indebted). You can also see the question “Also records as Expense / Income at Cash Book?”. If you select “Yes”, then the amount of this new debt or credit will also be recorded as Expense (if debt) or Income (if credit). You can also choose the Cash Book and Categories where this income / expense will be recorded. Save this form, then you will see the result in the list. If you also record as expense or income in the Cash Book, this debt or credit amount will also appear in the Cash Book. Repeat this process if you want to add more debt or credit. There is no debts or credits limit for Premium users, but Standard users are limited only 5 each debt and credit. This features also allows you to record the history of additions or subtraction of each debt and credit. Therefore, the entire activity or installment payment of each debts or credits can be recorded and tracked. To do so, click on the “magnify” icon, then you will see a page that contains the details of the current debt or credit. On the detail page , there are two main buttons that serve to increase or reduce debt or credit. Button (-) Pay Debt: record the debt reduction, that is when you pay a portion or pay it off. Button (+) Add Debt: record additional debt, that is when you owe more to that person or when there are additional costs such as interest. Button (-) Got Payment: record the credit reduction, that is when people who are indebted to you pay the part or his/her entire debt on you. Button (+) Add Credit: record the credit addition, that is when you give money or loans in addition to the person who owes you. 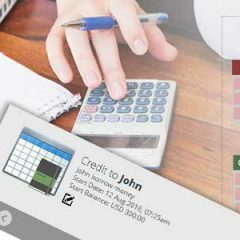 Just like when creating new debts or credits, every activity of the addition or subtraction of debt or credit can also be automatically recorded in the cashbook. After saved, then such activity will appear in the list, complete with the balance progress. In each row of activity there is (X) button, which serves to remove the activity. Note: When you delete an activity, if you previously also noted the activities in a cashbook, then the transaction in the Cash Book also deleted. If a debt or credit is paid off then you can hide it. On the detail page of debts or credits you will see the “Hide” icon. Click on the icon to hide the current debt or credit from your list. Note: This icon appears only when this debt or credit have been paid off. If at later time you need to see the history of these debt or credit again, then you can re-display it. Just click the “show” button contained in the debts or credits list. Note: This icon only appears when there are hidden debts or credits. The initial amount and the properties of debts or credits can be edited via the “Edit” icon that appear on it detail page. Use this icon to change the initial data. You can also use the “Delete” button that appears in the pop-up to remove or cancel such debts or credits. When editing your debts or credits, if you previously also noted the initial amount in the Cash Book, the transaction in the Cash Book will also change. When deleting debts or credits, then the whole activity of it additions and reductions will also be deleted. All transactions on the Cash Book that related to this debt / credit and all activities will also be deleted. If a debt or credit have been paid off and you want to remove it from the list, you do not need to delete it, all you need to do is just to hide it (see above). di app android blm ada tombol pencariannya, trs apa mengmang di setting untuk tidak dapat mengedit hasil utang piutang yang sudah terinput? Saya sudah coba untuk menghapus data utang yg saya input, tp tidak bisa dihapus, tombol hapusnya tidak berfungsi, kenapa yaa? Mau hapus transaksi piutang tidak bisa ,kita sd lakukan sesuai tutorial namun tidak terhapus ..? Bisa dijelaskan bagaimana cara yang digunakan menghapusnya serta bisa diinfokan mengenai detil dari alat yang dipakai ke https://www.akun.biz/contact/ ? (Jika app mobile, maka menggunaka merk dan tipe HP apa. Jika browser, menggunakan browser dan OS apa). Sebab setahu kami tombol hapus berfungsi lancar. Laporan Kas hanya menyajikan transaksi di kas saja. Jika utang piutang tidak turut dicatat di kas, maka transaksi tersebut juga tidak muncul di laporan, mungkin di situ masalahnya. Utang piutang memang tidak ada laporannya. barusan saya mencoba untuk membuat user dengan “custom”, dengan salah satu opsi nya bisa mengakses fitur utang & piutang. cuma di versi desktop tidak muncul tombol/menu untuk menambah utang / piutang, sementara di versi android ada. Mungkin hal tersebut terjadi pada saat kami melakukan perawatan script. Coba diakses lagi, beberapa menit lalu kami periksa dan tidak ada masalah. Met pagi mas, maaf mau minta tolong lagi. Sewaktu nambah piutang untuk nama yg sama, (yg sblmnya sdh dinput), ga bisa disave dan muncul komen untuk refresh atau tekan F5. Setelah itu dilakukan masih tetap ga bisa. Mohon dicek ada masalh dimana ya mas. Ini untuk usr custom. Disini kami periksa normal mas, mungkin pas ada gangguan koneksi. Bisa minta bantuan untuk dikirim screenshotnya via support[at]akun.biz ? Kami akan memeriksanya lebih dalam. untuk laporan kas harian, versi adroid nya ada feature untuk melihat transaksi harian pada tanggal2 tertentu tapi di versi dekstop nya ga ada fasilitas tersebut. kenapa ya ? Maaf Pak, saat ini belum ada. Tetapi terima kasih masukannya, akan kami pertimbangkan di update selanjutnya. Untuk download piutang bisa tidak sesuai customer? Misal kita sudah ketik nama customer, muncullah semua data transaksi atas customer tersebut. Tapi saat ke bentuk PDF yang muncul semua daftar piutang termasuk jumlah. Intinya klau ada pilihan data per customer dan jumlah rincian piutang secara otomatis. Bapak tinggal buka halaman detil piutang kustomer tersebut, sehingga muncul history piutangnya, lalu klik icon download pdf/xls yang tersedia. Maaf, boleh dijelaskan maksud gak berurutan bagaimana ya? Karena secara default, kami mendasarkan urutan hasil penginputan sesuai waktu penginputan itu sendiri, dan hal itu juga bisa disorot sebaliknya yang paling atas menjadi paling bawah, pun sebaliknya. Saya baru menggunakan akun Premium,, apakah rincian utang bisa ditampilkan secara terpisah..
Apakah maksud Bapak/Ibu Marlo MW tampilan terpisah pada buku utang ini ditujukan untuk pengguna tambahan multiuser? Jika maksudnya seperti itu, memang kami masih mengadakan riset perihal tersebut. Ada beberapa hal teknis multiuser yang masih kami godok dan juga analisa. Semoga bisa segera terlaksana apa yang Bapak/Ibu harapkan. Namun apresiasi kami haturkan kepada Bapak/Ibu Marlo MW yang telah memberi inputan demi kemajuan bersama.